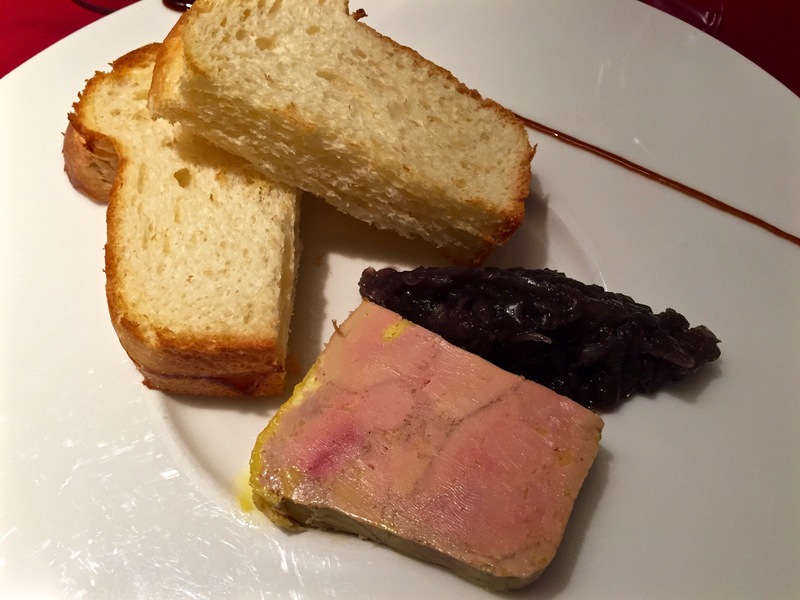 While I’m busily writing the France 2016 Trip Report (which should be slightly shorter than War and Peace), I thought I’d include a couple of France restaurant reviews to (for lack of a better phrase) whet your appetite. 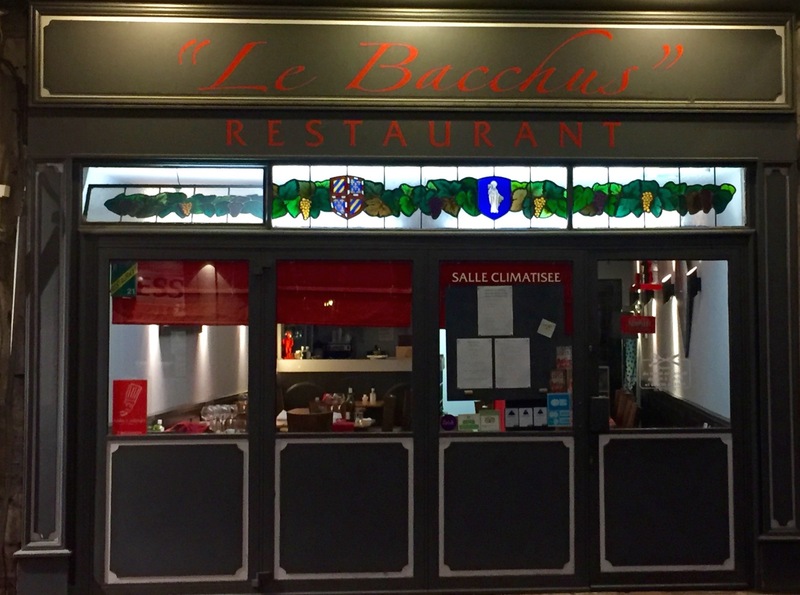 This trip we were fortunate enough to dine at some of the best restaurants we’ve encountered on any of our journeys, including this one (Le Bacchus in Beaune, Burgundy). On our first night in the delightful town of Beaune, Tracy and I (along with friends Greg & Gloria, who we hooked up with for a few Burgundian days) walked to a little place I had read great things about before leaving on our vacation. 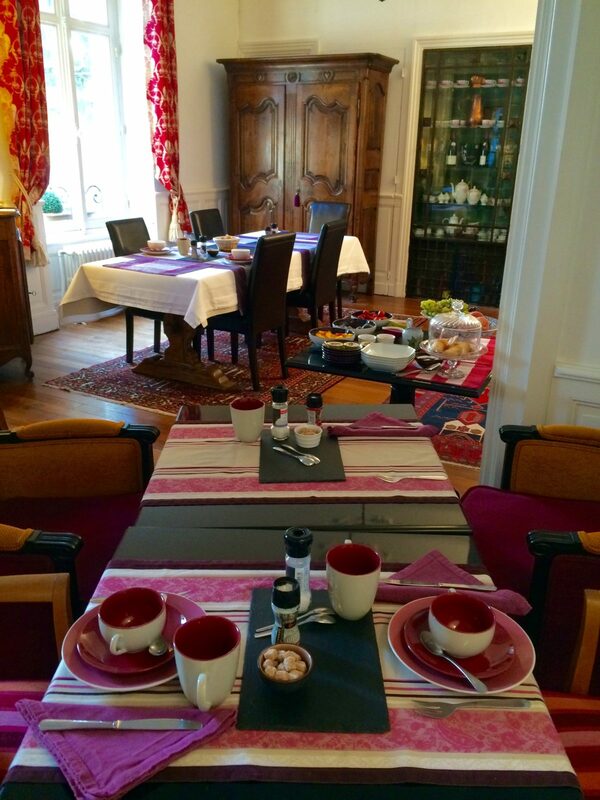 Le Bacchus also garnered praise from the owner of our incredible Beaune B&B (you’ll have to wait for the report to read about one of the greatest places we have ever stayed at on any of our travels..the photo below is from its gorgeous breakfast room). Back to dinner. Le Bacchus seats approximately 20 to 25 people and is owned by a husband and wife team. Anna works the room as the server, while Olivier cooks up their scrumptious dishes. The decor of Le Bacchus is cute enough, but the food and service are what makes this restaurant stand out. 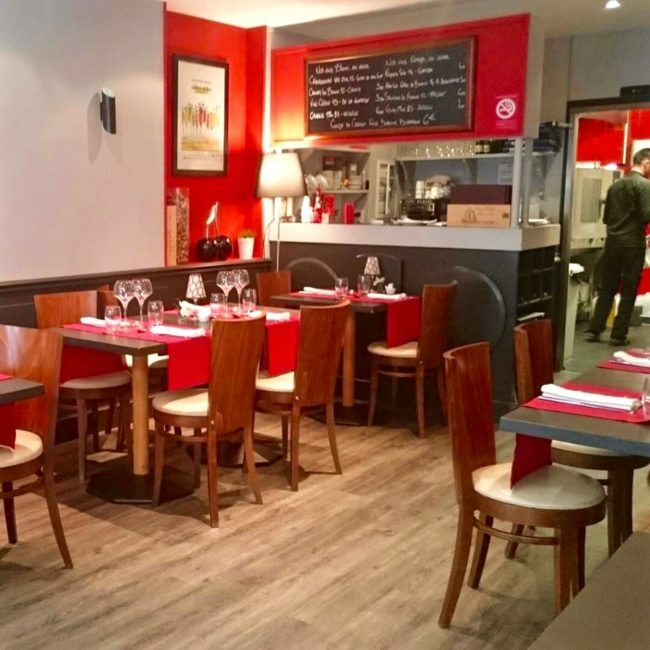 Fortunately, we had reservations at 20:00 (8 p.m.), because within a matter of minutes every table was full (interior photo courtesy of Le Bacchus). Anna spoke good English, however when we inquired about a menu item, she whipped out her iPhone explaining it was easier to show us a photo than trying to explain, proving that a picture really is worth 1,000 calories. It was a cool idea (she is quite a good photographer, and it is a fairly ingenious idea…as long as you take as good a photo as she did), and it also foreshadowed something that happened a short time later. Anna also helped us with the wine selection pairings; we had two bottles of wines from the region. The four of us opted for the €25 entrée and plat choice (€30 for entrée, plat and dessert or fromage), although if we had been so inclined we could have added a dessert at the end (did we or didn’t we?). 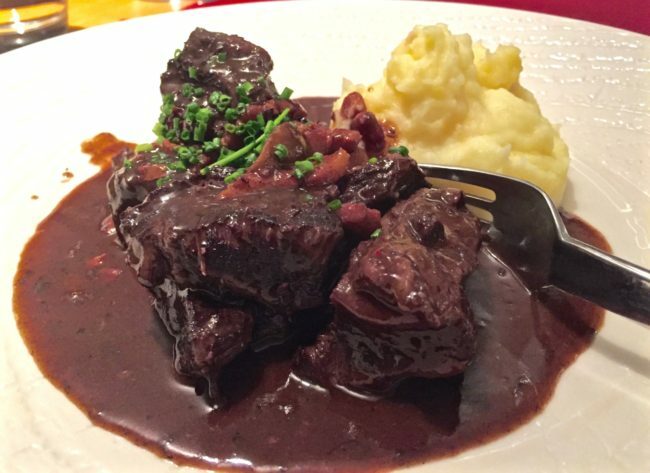 It’s not often that nearly every dish at a single meal gets a “Wow,” so Olivier at Le Bacchus receives kudos for the wonderful food he cooked on this evening. Diversion: Truth be told, since this website started, Tracy and I have become those obnoxious people (to some) who photograph their meal (hey, at least we never use a flash anymore). 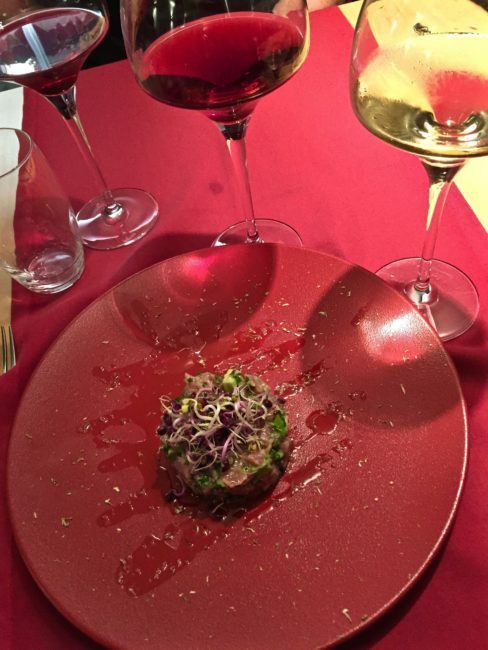 I also invite whomever is unlucky enough to be dining with us to please take photos, as well. Most people we know still dine with us despite our annoying habit. As we photographed our plats, Anna stopped by the table and gave us a short primer on how to take better food photos. As someone who flunked photography in college (I made the mistake of telling my teacher that it was easier to take the film to FotoMat rather than spend hours in a secluded darkroom), I welcomed her suggestions, and she was correct. Her photo technique was certainly better. I asked if she could travel with us for the remainder of the trip and take photos, but I guess her restaurant takes precedence. For our plat, Tracy and I both ordered the Joue de Bouef à laBourguignonne et son écrasé de pomme de terre. That sounds so much cooler than beef bourguignon with mashed potatoes. It was very, very good (Tracy puts these kind of dishes in the “Yummy” category). …but it was Greg who ordered the most photogenic meal of the night (not to mention it was also delicious.) 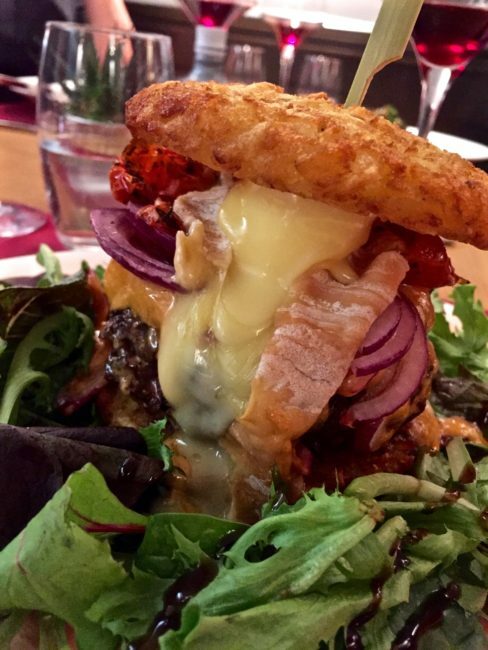 The dish was called, I believe (we were on our second bottle of wine by now), Le Burger Charolais à l’Epoisses. Il y a galette de pomme de terre, Époisses, oignons rouge, tomates confites, sauce cocktail et 220 g de Boeuf Charolais. “Charolaise” is a breed of white cattle found in the Burgundy region. After a delectable dinner like that, you might think that the four of us would have no room for dessert. Au contraire, mon ami! However, since I was worried that I wouldn’t fit in my travel pants after only three days in France, the table decided (what, you’ve never heard of a talking table?) we would split the dessert, and it would turn out to be yet another “Wow” dish. 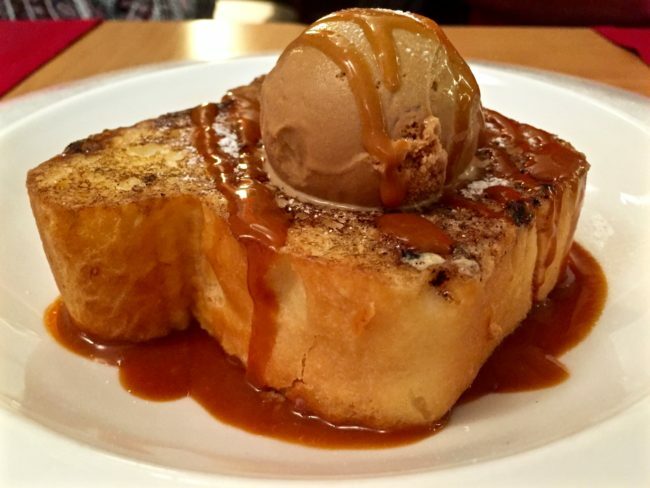 We shared a Bríoche façon pain perdu, sauce caramel, et sa glace (brioche French toast with caramel ice cream drizzled with caramel sauce). Incroyable!!! After one bite, I was a little sad that we had shared, because I could have devoured it in a matter of minutes. We had such a good time and enjoyed our food so much that we were the last diners to exit. I hope we didn’t overstay our welcome. 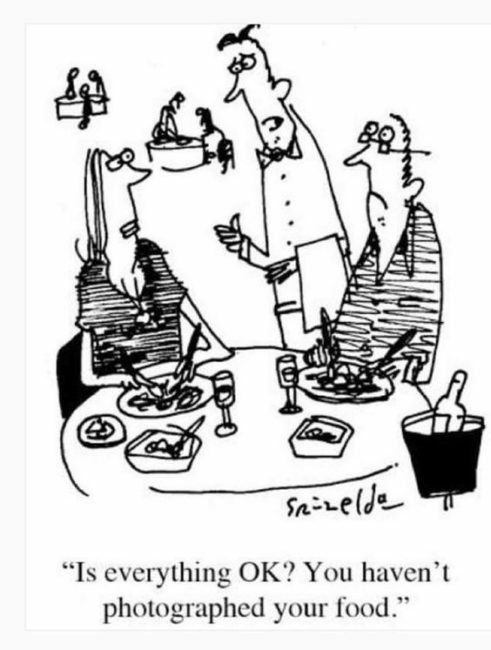 We all believed a little soft background music could even further enhance this wonderful experience, but that said, it was nice to be able to hear our conversation, which seems to becoming a little harder in many of the new establishments I’ve dined at recently in the Los Angeles area. 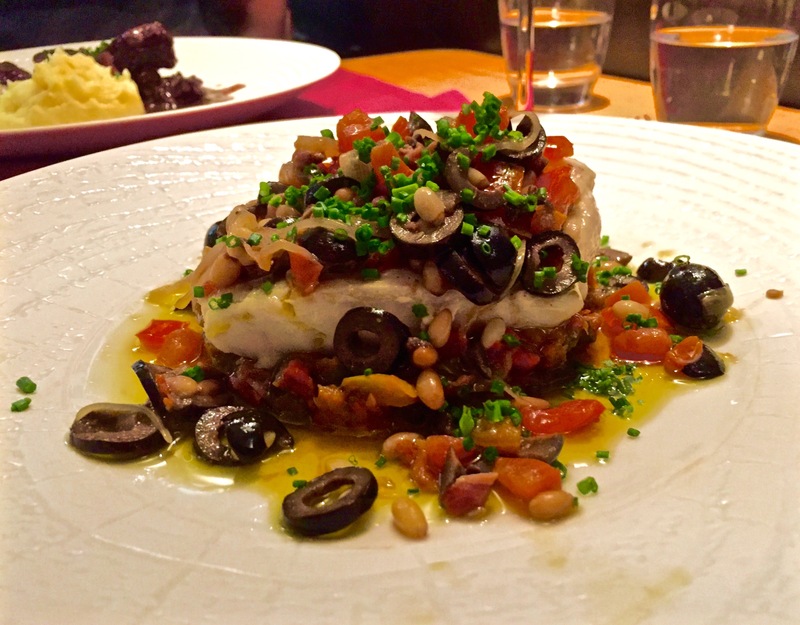 In a trip full of sensational meals, our dinner at Le Bacchus ranks very near the top in both quality of food and quality of service…all at a very reasonable price. Anyone traveling to this cute town should make Le Bacchus a high priority. With so few tables, I highly recommend you make reservations (you can reach them on their Facebook Page). Tres bon in Beaune. Thanks Anna and Olivier for one terrific and memorable meal! Open: Tuesday – Saturday from Noon to 2 p.m. and 7 p.m. – 10 p.m.